If you haven’t been introduced to our Montessori wall map and quiet book yet, you can read all about it here. This post will be for the first continent in the series: Africa! Every continent will have landmarks and animals. Some, like Europe, have more landmarks than animals. Africa is heavy on the fun animals! 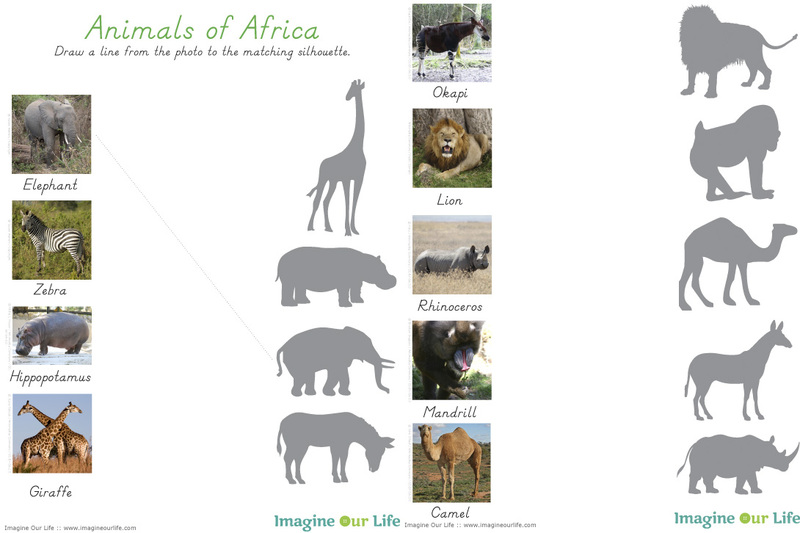 Those of you who follow along on Facebook or Instagram have already seen the animals and landmarks I created for Africa. I’m so exciting to be working on this project! It was YOU who voted on the Facebook page to make a world map the next quietbook project, and I’m so glad! This will be an amazing resource for Jax throughout his school years. I am posting this project in segments instead of all at once so that you can sew along with me! 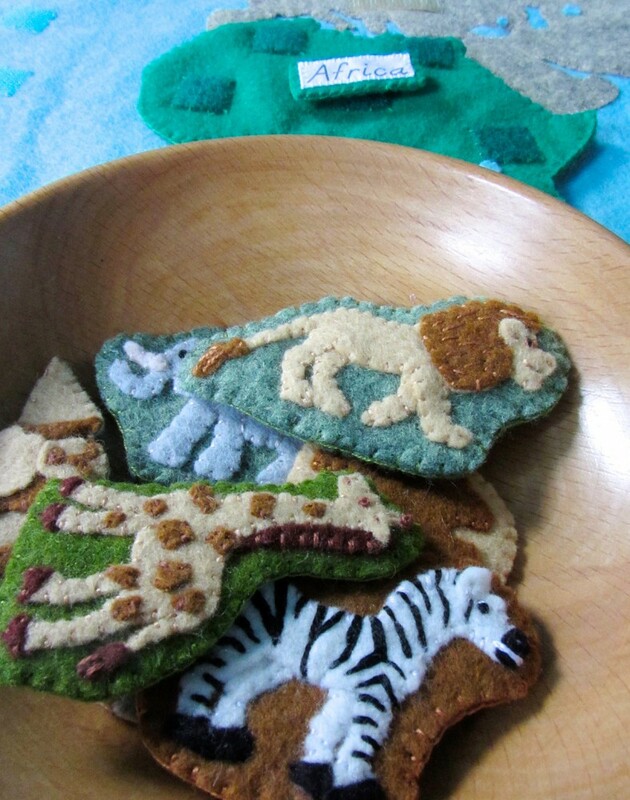 Felt from American Felt & Craft – jungle vine [green], pastry [tan], doe [brown], cactus [gray-green], chocolate [brown], cilantro [green], white, black, gray, chai [beige] and fresh linen [off-white]. From Benzie Design – swan [blue] for the water. 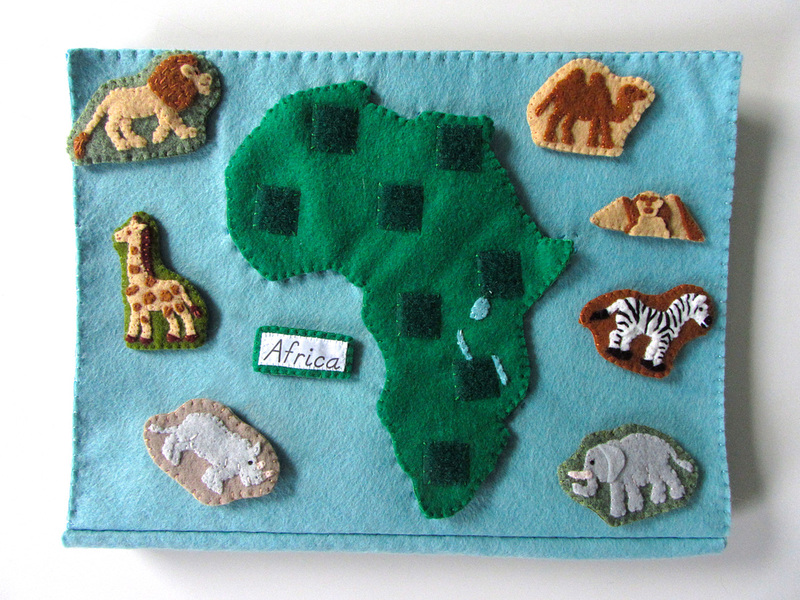 Hook & Loop – I used white snag-free Velcro on the backs of all pieces, including Africa. I used the soft loop side of green hook & loop on the front of Africa. 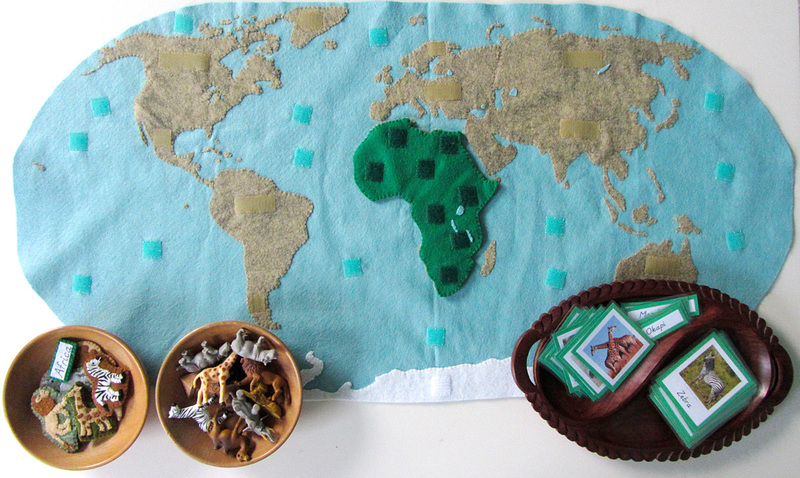 Africa: (Felt used: jungle vine green and scraps of swan blue for the water) For the African continent puzzle piece, I started by gluing then sewing the water down to the front side. Then I sewed down pieces of green loop Velcro. 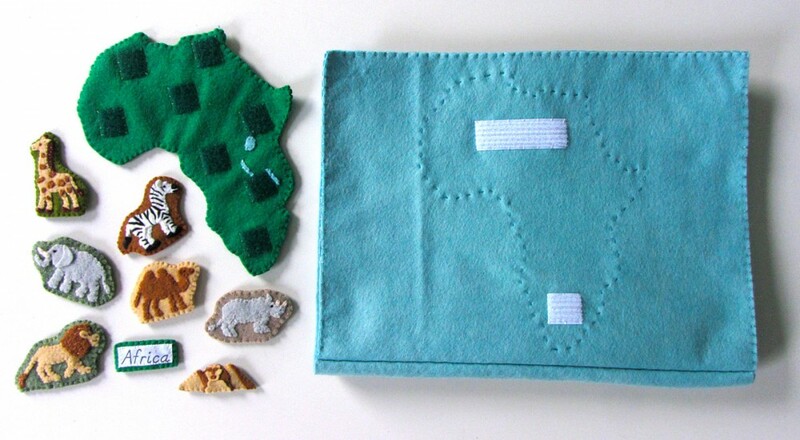 On the back, I sewed strips of white snag-free Velcro to correspond with the Velcro on the wall map and quietbook. I finished it by sewing the two sides together around the edge with a blanket stitch. Label: (Felt used: jungle vine green) For the continent label, I folded under the edges (just a tiny bit to hide the rough edges) and creased it with my nails. The printer fabric held the folds nicely without ironing. Then I stitched the label to some green felt and trimmed it down to be a border. I cut a matching felt rectangle for the back, sewed snag-free Velcro to it and then sewed both sides together. For all of the animals, I started by gluing the pieces down to a scrap of background felt with a very light amount of felt glue. 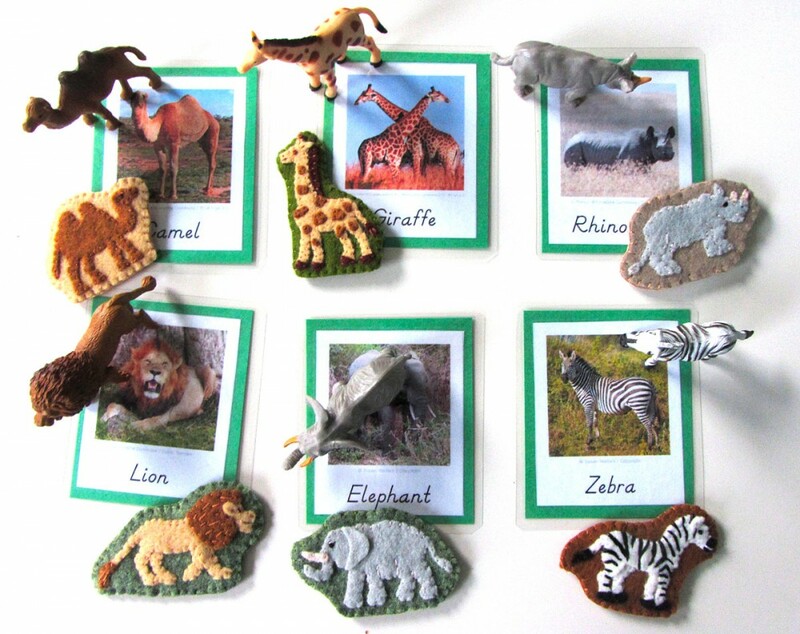 I glue several animals at a time to give them time to dry. I sewed them down, trimmed the background and cut a matching backing piece. I sewed snag-free Velcro to the back and sewed both sides together with a blanket stitch. Lion: (Felt used: pastry tan for the body, doe brown for the main/tail and cactus gray-green for the background) For his ear, I put glue on the entire back side but only stuck it down where it attached to the head. The glue dries to stiffen the ear. I made one stitch across the bottom of the ear to keep it secure. I sewed around all the edges, then made some long stitches in the mane and tail. His eye is a French knot with a black stitch going vertically through the center. His mouth is a long stitch and his nostril is a little stitch. Camel: (Felt used: doe brown for the body, pastry tan for the background) I started sewing the camel from the SafariLTD figurine before I’d done anything more than check where in Africa camels were located (northern and the horn). 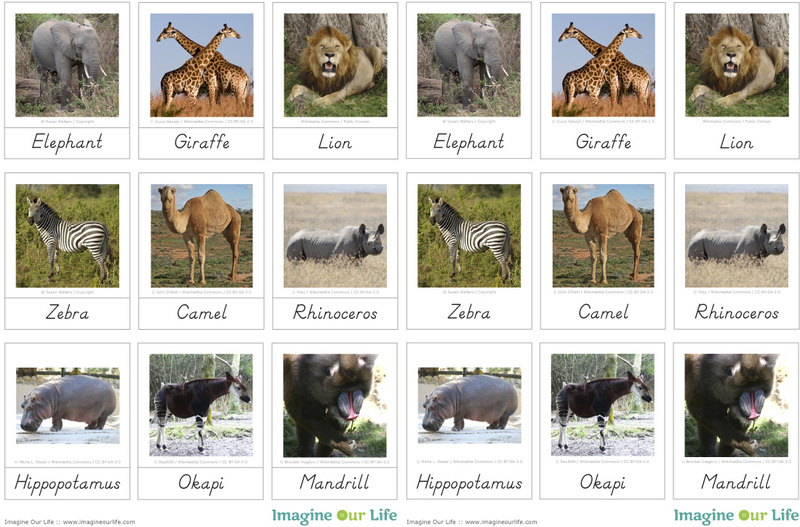 Once I started researching for the 3-part cards, I learned that African camels have one hump – Asian camels have 2! Oops! I’ve included patterns for both, so you can take your pick. I sewed all around his body. His ear is done the same as the lion’s. He has a French knot eye and a long stitch for his mouth. Elephant: (Felt used: gray for the body, fresh linen off-white for the tusks and cactus gray-green for the background) The elephant’s ear is glued down on one side. I actually forgot to put some stitches in, so I have to go back to that. I added some back stitching to make the wrinkles around her legs and a French knot eye. I used gray floss to stitch a line over the eye for an eyelid. The mouth is a long stitch. Giraffe: (Felt used: pastry tan for the body, doe brown for the spots, chocolate brown for the hooves and mane and cilantro green for the background) I glued down the mane and body (with the body on top), then glued the hooves, tail end and spots on. I stitched all the way around, making longer stitching in the edge of the mane and tail to look like hair. I used a few small stitches to sew each spot down. There is a French knot at the top of the horn and for the eye. I stitched a little nostril and a mouth. The ear is attached the same as the lion’s. Zebra: (Felt used: white for the body, black for the hooves/muzzle and doe brown for the background) The zebra has the most intricate stitching. After I sewed all around her body, hooves and muzzle, I made a French knot eye, white long stitch mouth and attached the ear the same as the others. Then, using black floss, I stitched on the stripes, using my SafariLTD figurine as inspiration. The stripes were stitched almost in a kind of satin stitch (where you fill in an area with stitched that all go in one direction). I just kept added stitches to widen the lines, often at angles to make them slightly triangular. At the neck where the mane would start, I made sure to start a new stitch in the stripe at a different angle to show the neck’s edge. Rhinoceros: (Felt used: gray for the body, chai beige for the background and fresh linen off-white for the horns) The Rhino was stitched very simply, though I did add some back stitching to show the wrinkles at the tops of his legs. He has a stitched mouth and nostril and a French knot eye. Pyramids & Sphinx: (Felt used: doe brown and pastry tan) I combined two landmarks into one felt piece for the pyramids of Giza and the Sphinx, as they needed to be at the same spot on the map. I will eventually make 3-Part cards for the world landmarks, and there will be two for these to make the beautiful SafariLTD figurines. I started by gluing down the layers: the pyramid sides onto the pyramids, then the sphinx, torso, face and finally the features. You may need tweezers for those. Goodness, they are small! I made some small stitches in the features to keep them secure, but didn’t sew down anything else. I cut out a backing felt to match the final shape and added some snag-free Velcro to it. Then I sewed around the whole edge, switching colors where needed. Jax just started his world continent unit with the world continent 3-part cards I made up for him. I’m saving up for a Montessori globe at the moment, so I’m not really rushing the lessons. 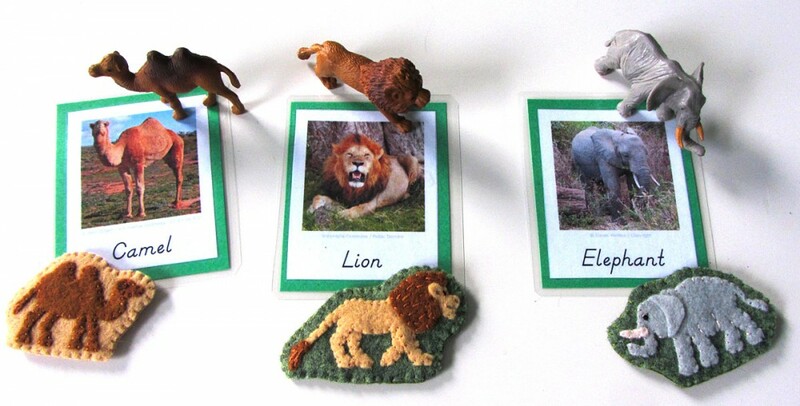 When we start on his Africa unit, I will present these cards. 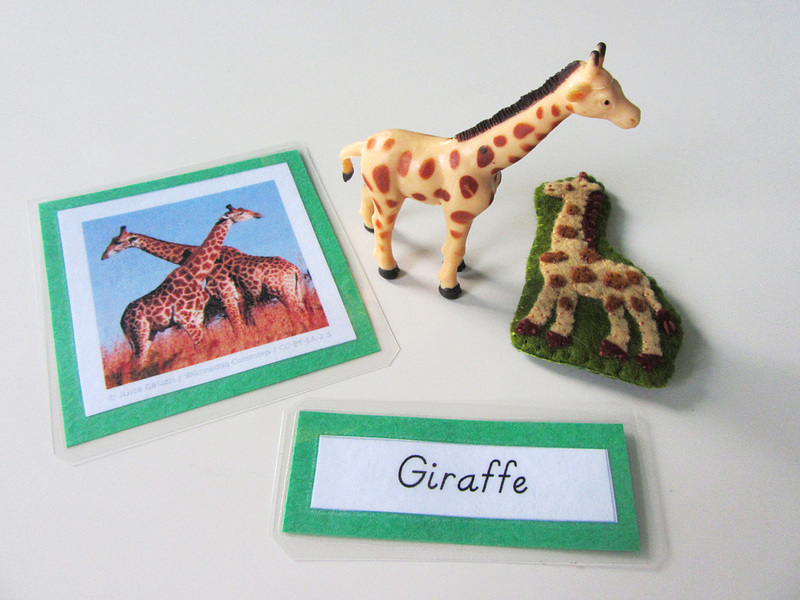 I created these cards to be used along with SafariLTD’s TOOB figurines. 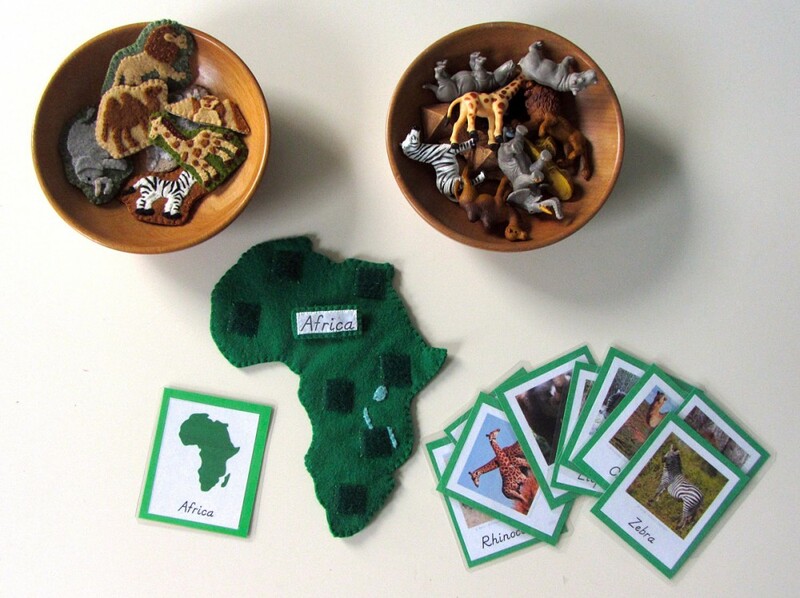 My African animals use the Wild Toob and Monkeys and Apes Toob . I also need to pick up an okapi figurine. It will be a larger scale than the TOOB animals, but it is worthwhile for Jax to have something 3 dimensional to look at. Click here to download my free pdf file to make your own. 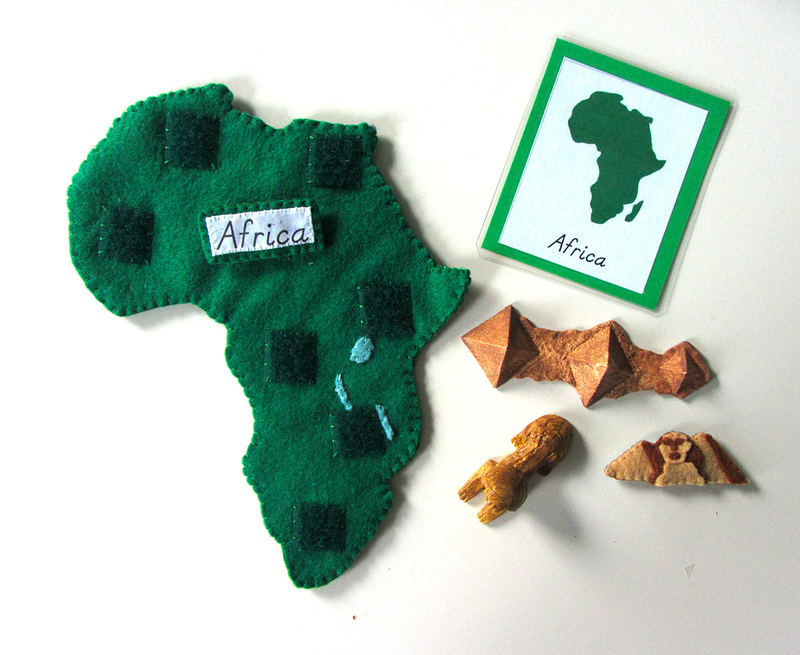 To make mine, I cut them out, glued them to green construction paper (to match Africa’s Montessori color) then laminated them. I’m still loving my new laminator ! It makes everything so pretty and durable! Jax is really into mazes right now, and they are great for pre-writing skills! 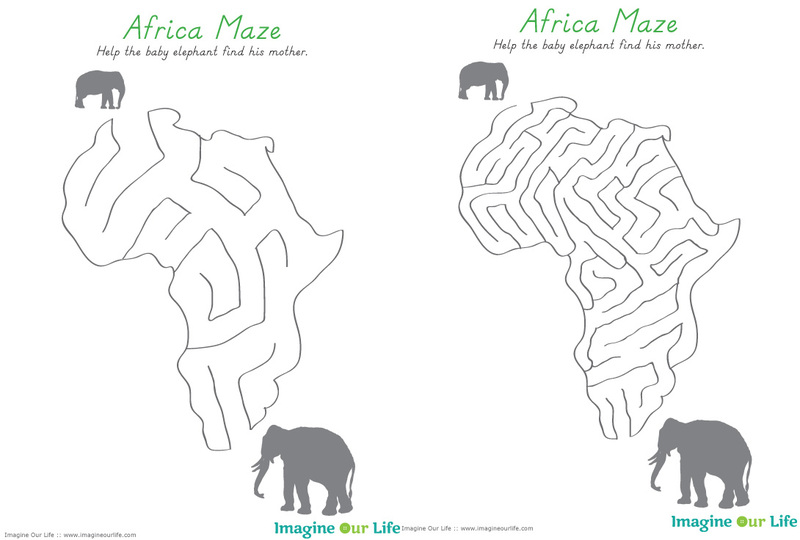 I’ve designed two mazes for him – one basic and one advanced. Grab them here! We’ll most likely laminate them so we can reuse them. I’ve included an answer key page on this if you want some correction of error. Silhouettes from All-Silhouettes.com. 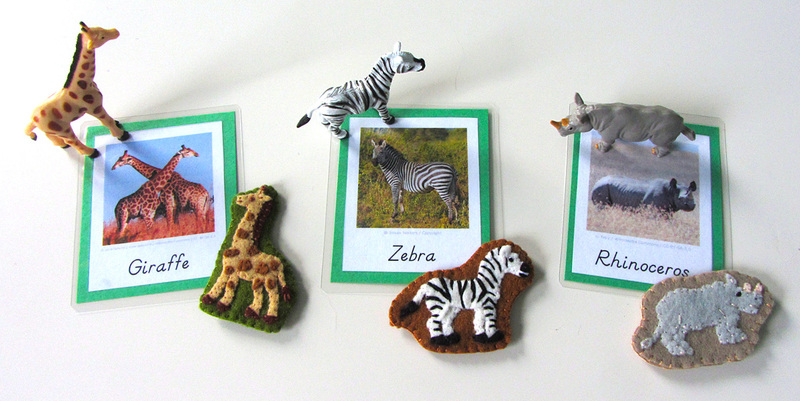 Another activity that will help Jax with him reading and writing skills is the African animal silhouette match. Drawing lines between the matches help with writing skills, and recognizing the similarities between the photos and silhouettes helps build visual skills needed for reading. Silhouettes (except for mandrill) from All-Silhouettes.com. I hope you are enjoying this project as much as I am! A number of you have told me you’ve already begun the huge wall map. I’m really excited to see how they turn out! Tag me on Instagram @iolstephanie (I can’t answer on your photo if it you are private, but I can try to comment in a different place) or share photos on Facebook. You can also email me. I’m a bit late for Montessori Monday this week due to vacation, but I hope you’ll check out the other great links! 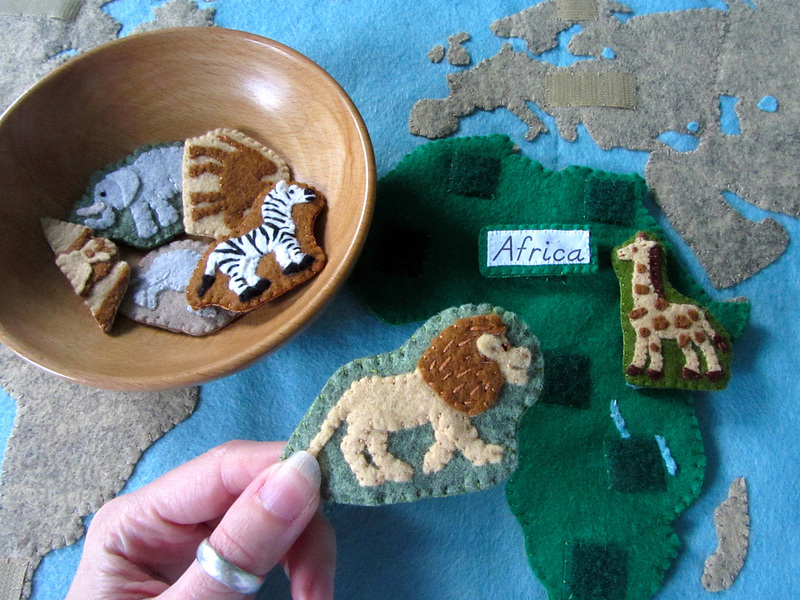 This entry was posted in Homeschool, Montessori, Quiet Book, Sewing and tagged Africa, Continents, Free, Homeschool, Montessori, Patterns, Printables, Quiet Book, Sewing on July 18, 2013 by Stephanie. Wow. Definitely blown away by this project and all of the different activities you’ve shared here. 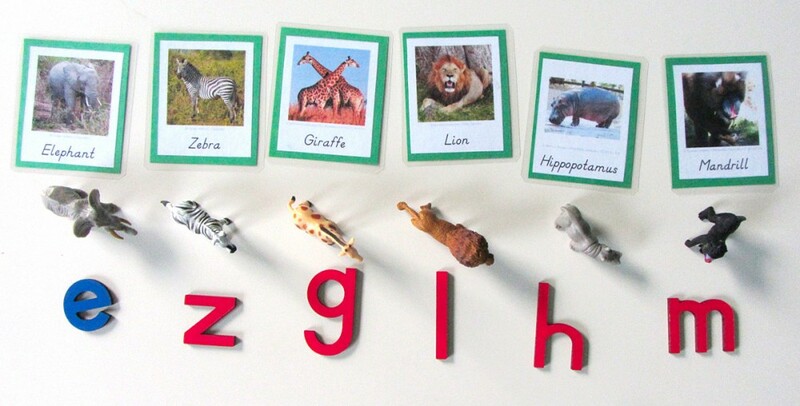 Such a great teaching tool and keepsake that any kid would love playing/learning with! I need to finish up some projects so I can make one for my daughter. Thanks for sharing all of your patterns!!! 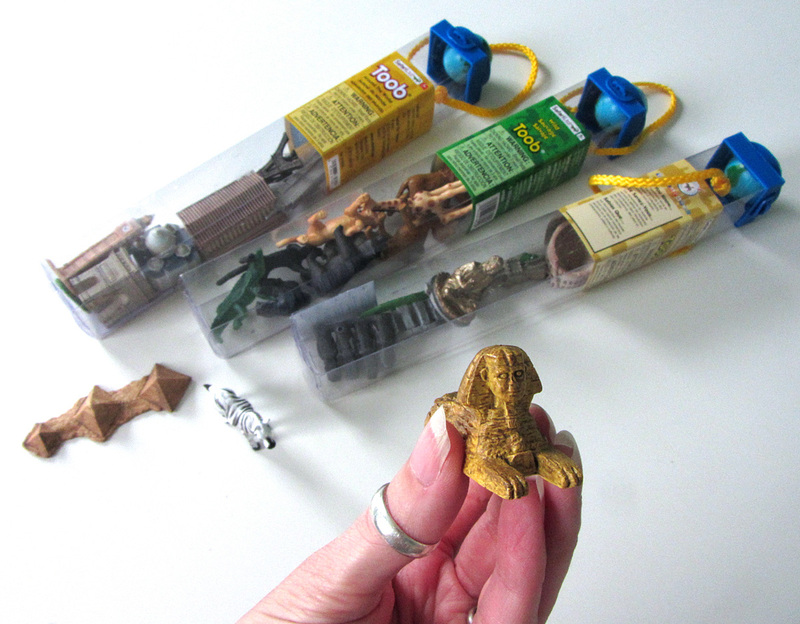 Looks like I need to start collecting these tubes of animals and landmarks now. Love how realistic looking they are. I’m STILL collecting them! I headed out to the craft store today with my coupon and rewards credit and they didn’t have either of the toobs I still need… Didn’t have the okapi either. Bummer! This is absolutely INCREDIBLE! I’m following now after finding you on Montessori Monday. I will share this on my page soon because I am so inspired! Awesome! Thank you! We just started Montessori/home school now that Jax is 3. 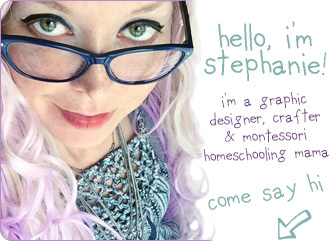 Loving the online Montessori blog community! Added your site to my Feedly, though I am 1.5 months behind in reading. Oops! I have already ordered the felt colors that I don’t have. I can’t wait to make this. Your animals look awsome, so detailed! These are incredible! Wow. 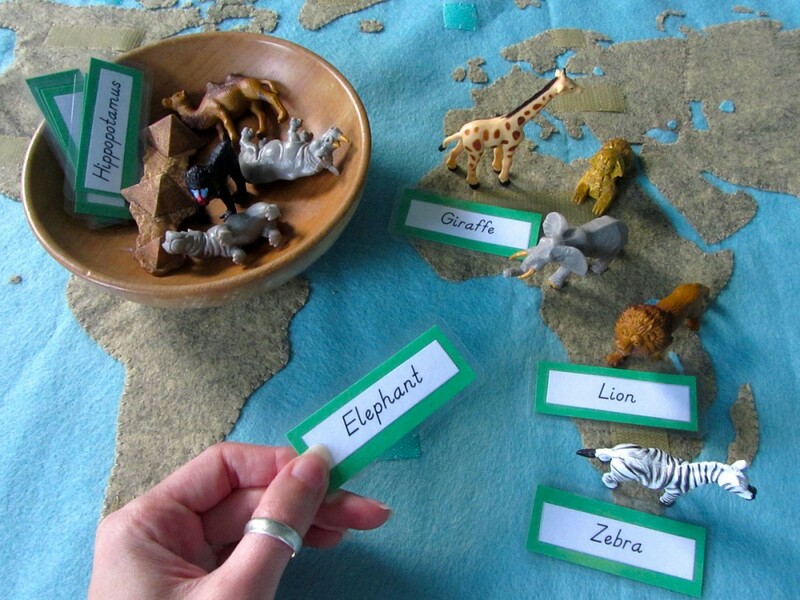 We love using maps with our animal and landmark TOOBs…but your map is even better. Will be making this ASAP! Thank you so very much for sharing. All I can say is A-M-A-Z-I-N-G!!!! Thank you for sharing your incredible talent. My daughter is 19 months and I am eager to make these projects so I can start her on Montessori when she turns three. Also because of your patterns and inspiration I have taken up sewing and have completed some felt book pages. Again THANK YOU!!! Oh my goodness. About two years ago, I pinned a picture (also on your pinterest board!) of a giant felt map. I drooled over it for about a week before determining that it was too big a project if I had to come up with patterns on my own. I cannot thank you enough for sharing these patterns, especially with all of the supplemental montessori materials…I have just started implementing montessori practices into our own home preschool with my two littles, and you are an inspiration and enormous help. Thank you a million times over! I was completely blown away when I stumbled across this. You are amazing for sharing it. I am currently working very closely with the Montessori Centre in London as they are training our primary school staff. There are not many Montessori state schools in England and we are a bit of a first. I shared your site with the centre and they want to give you a mention in the Montessori magazine that goes all around the world at some point in the new year. Is that ok with you? Getting back to the continents. 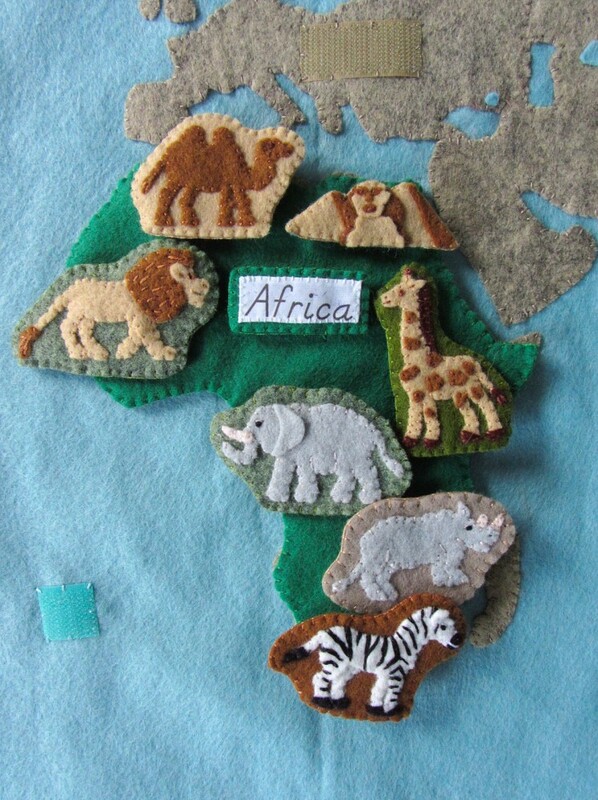 I have so far cut out Africa and bought the felt for the animals. I am not your traditional kind of sewing girl, but I was so inspired, I’m having a go! Determined to succeed. I did think I saw all the continents, but I can’t seem to find a pattern or feature for Australasia? Did I miss it somewhere? Australia will be coming soon – it is on hold due to holiday projects! Great. Look forward to Australia. What about the mention in the magazine. Are you ok for the Montessori Centre to mention your site? Hello! a question! What you put into the country to make this harder? Cotton or some kind of fabric or leave it as is, because if you put anything is fine! A kiss! 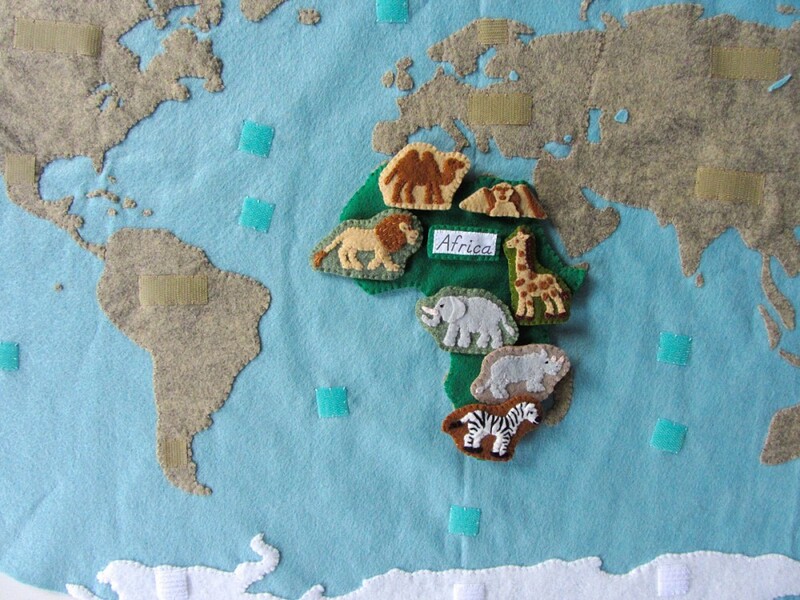 What shade of green is the Africa puzzle piece? 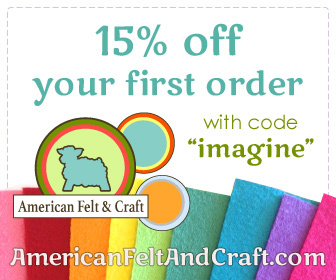 Trying to put together an order through American Felt and Craft and 6 colors are already out of stock. 🙁 Want to use good felt so it lasts. Thank you so so much for making this!! I am so excited and want to do a good job! I love your work so much and the fact that you are willing to share your patterns with the rest of the mums all over the world (e.g. I am from Romania) makes you my hero! 🙂 Thank you!